« Give it a rest! Lets check out the specs on this knife. Weight (with sheath): 14.7 oz. Weight (no sheath): 11.2 oz. I received this knife for Christmas last year. I am a avid hunter and wanted the knife because I watch all the survivor shows on tv. I love Bear Grylls show and also if you have checked out his website at all he does alot of cool things to help out around the world. 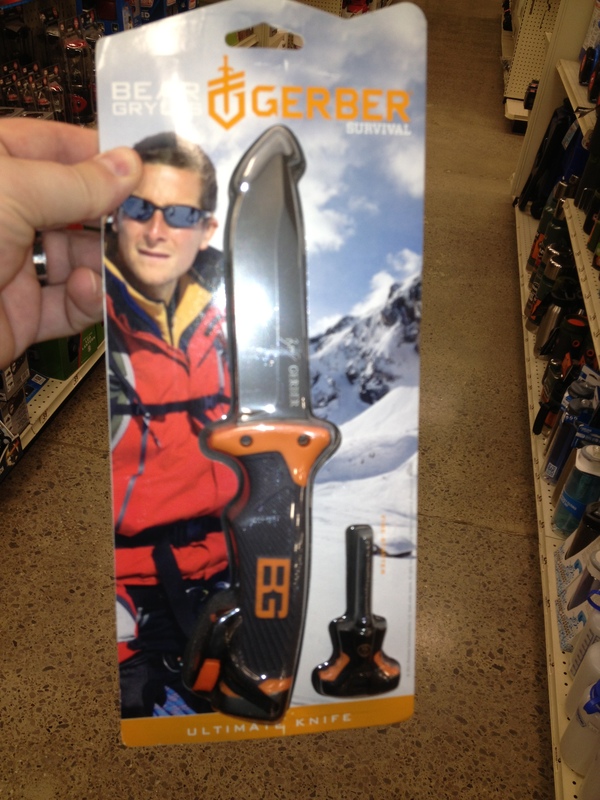 http://www.beargrylls.com check it out. Back to the knife. The blade I found is made of good steel, it has not chipped or dulled on me the whole year. I have used it to cut trees in half, gut multiple deer, start a fire with ease, hammer stuff with it. You get the picture. When I gutted the deer the handle feels very comfortable in your hand, it opened the deer up with ease cutting through the ribs all the way to the neck in one swipe. I split the pelvic bone with ease and have used it to hack at bone with no blade dullness or chipping. I have had other knives that the tips have broken off, blades chip, they dull after gutting one deer. This knife is still going strong. The serrated edge works great, there is a whistle on the handle for situation where you might get lost. The sheath had the ferral rod in it, a sharpening stone on the back, and also a survival pamplet to help if you need it. My brother once laughed at me, cause you know, it’s a gimmick thing. I tell you the gimmick is for real, it has been a great knife for various situations and I would buy this Gerber BG knive series again. I hope you all Like this product review, This is not a paid review. This entry was posted on December 20, 2012 at 12:31 pm and is filed under 6or7, antlers, archery, bear, deer, experience, fishing, fleece, g5, g5 quiver, guns, Hunting, outdoors, recipe, reviews, Ruttin' Review, scent-lok, sheds, sportsman, team dirt, typical, Uncategorized, vertigo with tags 6or7, antler, antler king, archery, bear, duck, fishing, g5, guns, hoyt, hunting, lee & tiffany, mossy oak, osama bin laden, outdoors, rabbit, real tree, small game, sportsman, target, thenontypicalsportsman, waterfowl. You can follow any responses to this entry through the RSS 2.0 feed. You can leave a response, or trackback from your own site. Awesome knife, check out the review! A great knife. I’ve had mine for about a year now.